With rumors of a new Apple TV set-top box swirling, Apple's brick and mortar stores have launched a one-week promotion offering customers who purchase the current model a $25 iTunes Store gift card, reports 9to5Mac. The promotion naturally sparks speculation that Apple is trying to clear stock of the current model ahead of new hardware. A recent report from Bloomberg claimed, however, that while Apple was aiming for an April introduction of the new Apple TV, a launch would not come until much later in the year around the holiday shopping season. The Apple TV recently received added prominence in the Apple online store with its own major heading as opposed to its previous placement as an accessory, suggesting that Apple may be laying the groundwork to move the Apple TV from its longtime "hobby" status to a full-fledged product on par with its other lines. Apple has reportedly considered a new set-top box that would combine the features of the current Apple TV with the Wi-Fi router features of the existing AirPort Express. The new Apple TV could also leverage iOS devices and Bluetooth accessories as game controllers for a potential Apple TV App Store, while also adding an Apple software layer on top of users' existing cable television services. Apple has also reportedly been in talks with Time Warner Cable about a potential content deal. The new gift card offer on the existing Apple TV runs through March 5 and is currently not offered on the Apple online store. As with all iTunes gift cards, the credit can be used in any of Apple's digital content stores, including the iTunes Store, App Store, Mac App Store, and iBooks Store. Update 8:20 AM: Apple has now posted the Terms and Conditions [PDF] for the offer, indicating that it is valid both in-store and online, but only in the United States. Update 3:07 PM: Notable Apple journalist Jim Dalrymple has said that a new Apple TV release is not imminent despite the gift card promotion. I push AirPlay on my iOS device, and in <1 second, I see that content on the tv. I don't care if it's mirroring an app or streaming a 2GB video, it needs to be instant. Waiting 2+ minutes to so that it can buffer a 3 minute long home video from my photos app is just useless, and the primary reason I don't yet have an Apple TV. Umm, mine is already instant? Even with the Apple TV already off, it takes five seconds tops. Maybe your network is the problem? Agreed. That sounds like 'his' network. If the ATV is on it is instant, and even from an off state it is ~5 seconds. That's more likely a problem with your internet connection or your router. I knew this would happen! I just bought one from Best Buy two days ago! Please get rid of my crummy expensive cable TV already, and give me a better UI than Youtube to watch things I'm actually interested in in its place. Very interesting. 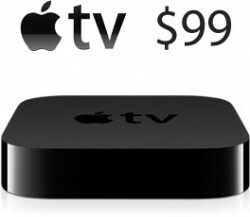 My only concern with a new revamped Apple TV is a price hike. If it adds an App Store and some other features I can see Apple jacking up the price. Right now the ATV is great because it's only $99. 2+ minutes?? Something's wrong. Mine has never taken more than 5 seconds. Without knowing anything more about your setup, if I had to guess, I'd say your router is the problem.